What are the Benefits of Hanging Exercise? Simply hanging a bar is undoubtedly the best upper body stretch, that you need to do daily. It is quick, simple and is really effective. In order to perform the hang stretch, you only will need a bar or something that can support your body weight to hang from. We will see how you should do it and all the benefits it will provide. Grab onto a bar. Wrap the bar with all your fingers, your palm facing away with a slightly wider than shoulder-width grip. Try to hang yourself without touching the ground with your feet. Keep your body in alignment. Our tip to help you keep your body aligned is to press your legs and glutes together and keep your abs contracted. You should feel a stretch across the upper back, biceps, and triceps. During the movement, try to relax your body and let the weight of your body drift towards the floor. This action is called “traction”, giving you the feeling that your muscles and body start to lengthen. As we have already said, the bar hanging is definitely the best you can do for your upper body. Hanging a bar will make your grip stronger as you will be supporting your entire body. Which means that you will be better in other training exercises requiring a strong grip (pull-ups, deadlifts, rows, etc). Having strong shoulders will allow you to perform safely pressing and overhead movements. Hanging a bar could be very useful for those who have spinal compression or pull heavy barbells on a regular basis. It can relax your back and relieve you from unwanted lower back pain and soreness. When we are hanging a bar, we try to keep our body in a straight position. If you do this exercise daily, it will increase your awareness of postural imbalances. Bar hanging is considered as a really good warm-up before a training proposing pull-ups, chin-up or other gymnastic movements. 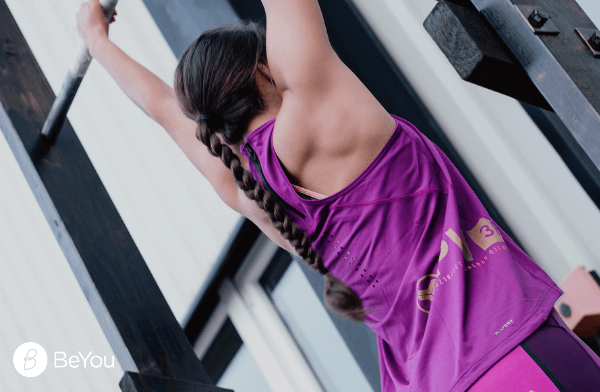 Hanging exercises can improve your workouts at a general level as you will increase grip strength, flexibility, body weight movement, shoulder stability, back strength, and posture.